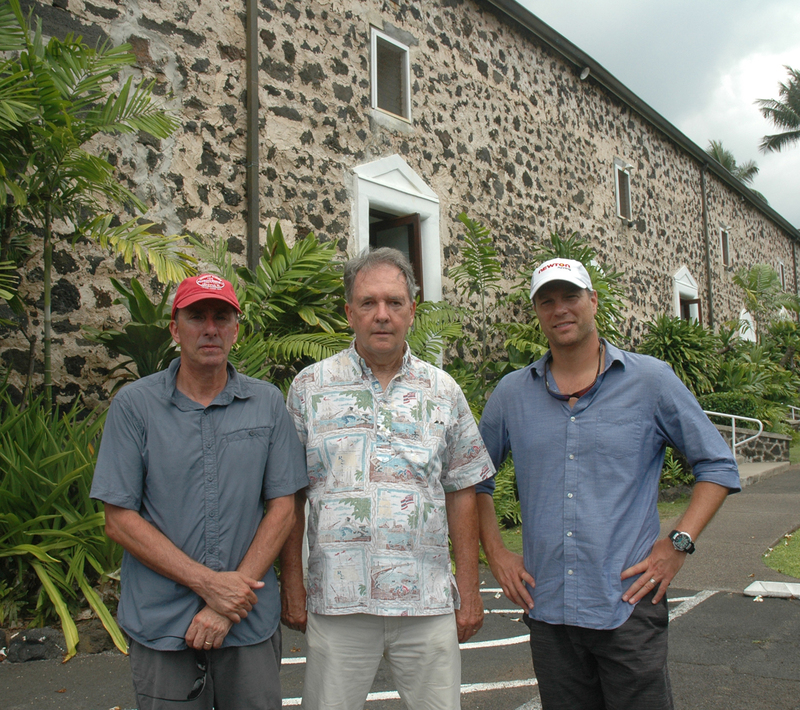 A nationally-renowned historical documentary film company traveled to Moku‘aikaua Church in Kailua-Kona Sunday, August 7 for location filming. Great Divide Pictures of Denver is filming for several documentaries, each set at a National Park Service historic site on Hawai‘i Island. 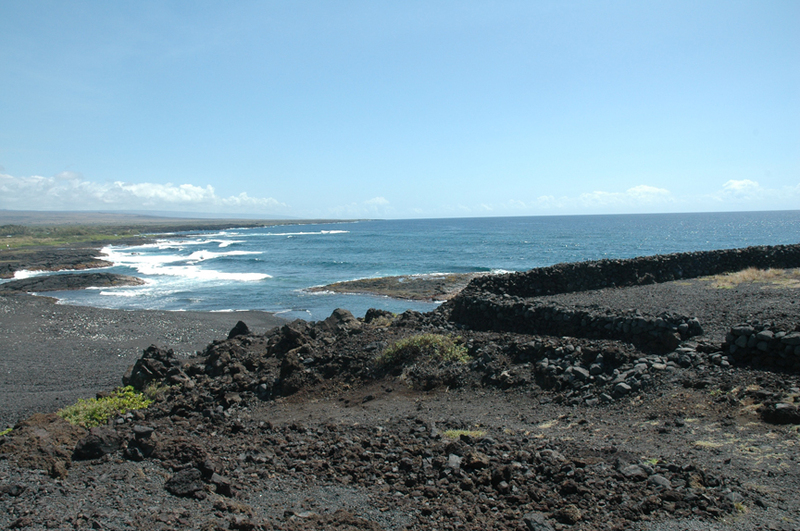 Moku‘aikaua, located along the waterfront in Kailua-Kona in leeward Hawai‘i Island, is located along an ancient, shoreline trail that is 175-miles long. Interpreted sections of the trail today are accessible to hikers and part of the Ala Kahakai National Historic Trail (). Moku‘aikaua is to be featured in the Ala Kahakai Trail feature. This photo is of Great Divide Pictures Executive Producer/Principal Photographer Chris Wheeler (l.), myself and Chuck Dunkerly (r.) from the Harper’s Ferry National Historical Park who was coordinating the production on-island. Chris and Chuck joined me in this photo taken in front of Mokuaikaua Church along Ali‘i Drive in Kailua-Kona. Sonny Hutchinson, Chris’ partner in Great Divide PIctures, took this photo and handled the audio for the shoot. The Great Divide Pictures team shot footage of the interior and exterior of Moku‘aikaua. 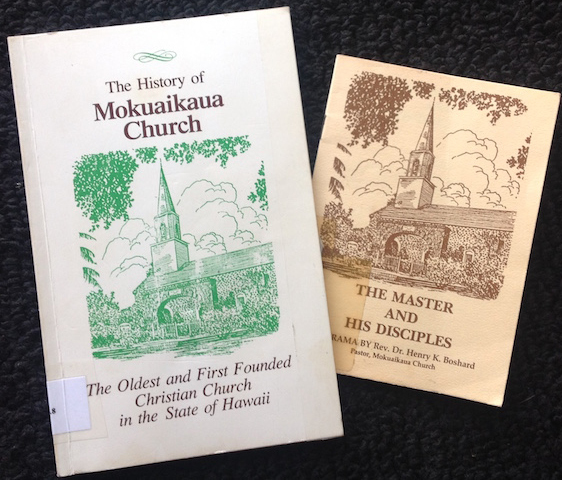 I supplied narrative on the history of Moku‘aikaua Church, which is considered the first Protestant church gathered in all Hawai‘i. 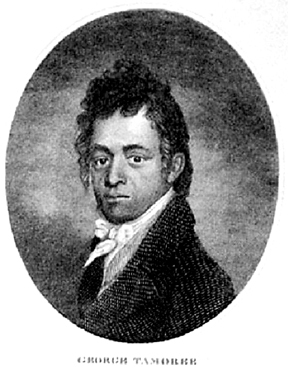 The pioneer Sandwich Islands Mission party arrived at Kailua on April 4, 1820. Kuakini, the ruling ali‘i nui of Hawai‘i Island in 1820 greeted the missionaries, aided in securing them permission to reside and establish a missionary station in Kailua-Kona, and built for the missionaries a series of three churches at Kailua-Kona: two thatched churches, the second destroyed by fire in 1835, and the stone-walled Moku‘aikaua Church (built in 1836) which is still actively used as a Congregational church. 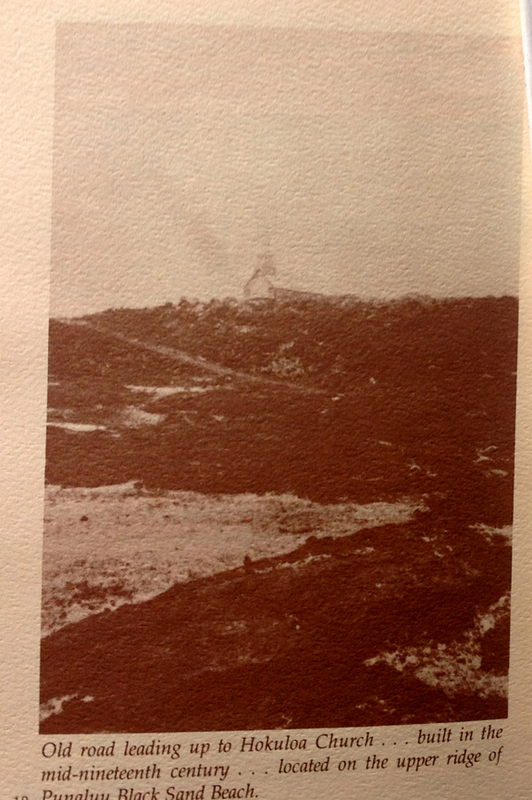 I am currently editing and designing a booklet on the history of Moku‘aikaua. 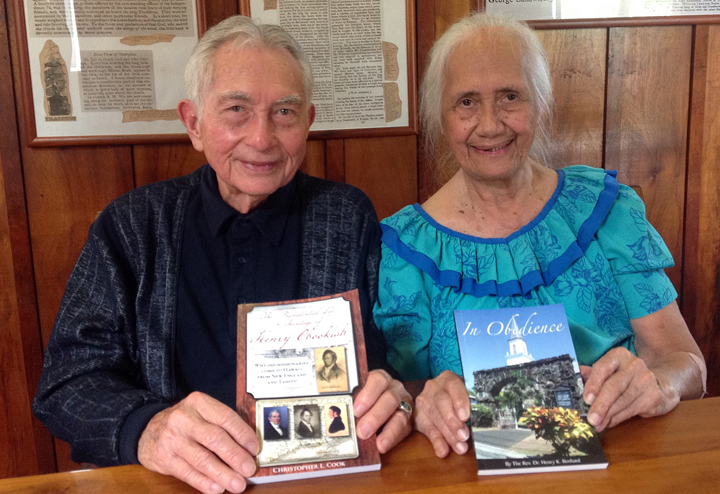 The booklet will support an effort to raise funds to keep the almost 200-year-old church earthquake resilient and to repair and restore aging features of the church. Go to www.mokuaikaua.com for more information. Digital copies of the booklet will be available by this fall on the Moku‘aikaua website. I am writing an essay to be featured in the booklet on the very interesting vernacular architecture of Moku‘aikaua. The building combines a structure based on a large New England barn of the post-Revolutionary War era, with materials readily available in Hawai‘i: Basalt-lava rock stones, coral heads burnt with firewood to create lime, and tall, sturdy hardwood ‘Ōhi‘a beams and posts. Moku‘aikaua is considered the mother Congregational church of Hawai‘i. 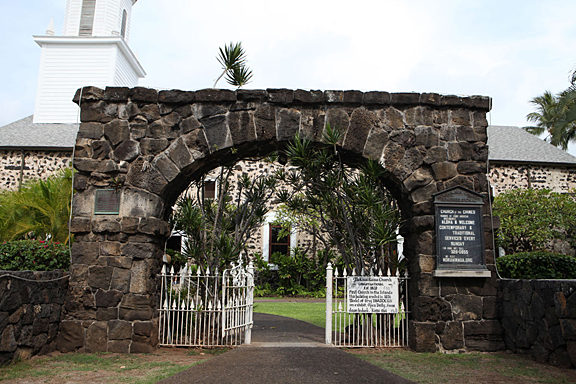 Elements of native Hawaiian culture are embedded in the church, including dressed hewn stones used as edge stones stacked up in each corner of the church building to anchor its heavy rock walls. The hewn stones were carried by a long line of workers from the nearby heiau (temple) of the legendary 15th century ruler ‘Umi. ‘Umi moved the capital of Hawai‘i Island from Waipio Valley on its windward side to sunny Kailua. His incredible, mauka (inland) agricultural system stretched south for miles, providing abundant food for ‘Umi’s people. Its rock wall landscape pattern is still visible today.